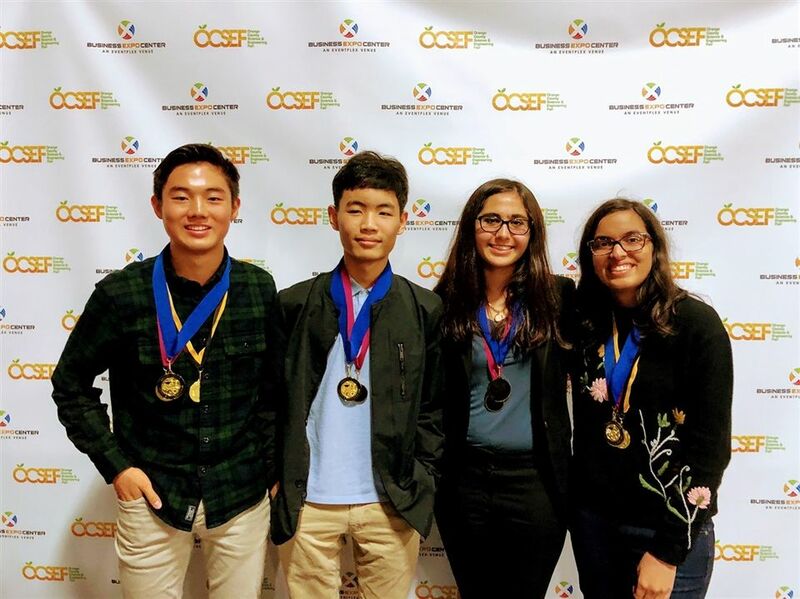 The OC Science And Engineering (OCSEF) awards were held on Friday, March 22, and four Sage Hill students won first place in their categories: freshman Nadia Ansari, junior Alex Kwon, sophomore Jian Park and junior Sasha Ronaghi. An honorable mention was also awarded to freshman Madeleine Yee. Ansari won the Sweepstakes Award for the entire senior division with her project, “Use of Pulsed Photobiomodulation in Nerve Regeneration after Injury-Induced Peripheral Neuropathy in Danio Rerio” in the Zoology category. She also won special awards from the CA Society for BioMedical Research and the Ron Orta Humanitarian Award. Kwon’s project, “Analyzing the Electrical Properties of Strontium Titanate: Can It Replace Silicon for Power Electronic Applications?”, in the Physics/Astronomy category also won him a special award from the American Vacuum Society. Both Kwon and Ansari were named Intel International Science and Engineering Fair Finalists and will compete in Phoenix this May. Only four students total were chosen from regional competition to move on to the ISEF competition, which means 50% of the finalists came from Sage Hill. Ronaghi won first place for her project in the Microbiology & Cell Biology category. Park won first place for his project in the Mathematics & Software category. Yee’s honorable mention was in the Fluids/Aerodynamics category. Photo: From left to right, Alex Kwon, Jian Park, Sasha Ronaghi and Nadia Ansari.